Penetrating the clouds of mystery surrounding the personhood of God. Is God a person who lives far away in His own spiritual land? Or is He very near, residing in the hearts of everyone? Or is He just plain everything? What would you say to these questions? Or, to put it another way, what do you think of when you think of God? You’re not alone if you find these questions hard to answer. Most people have only vague notions of what God might be like. People I’ve asked often say that while they think of God as having certain personal characteristics, such as beauty, power, and wisdom, they also think He must be everything or be within everything, like an all-pervasive energy—“The Force.” This is a revealing disparity, because it indicates that while many people believe God is a person, they realize that thinking of Him as a person in the strictest and most literal sense would limit Him. They’re afraid they might end up with an anthropomorphic conception of God, a “God” who is subject to all (or at least some of) the limitations and imperfections of ordinary persons. In Christianity, for example, we have descriptions of God as Father—certainly a personal epithet. But what does our father who art in heaven look like? On the ceiling of the Sistine Chapel there’s Michelangelo’s painting of God as an old man creating Adam, who, by the way, looks healthier and more handsome than God. So as I was saying, most educated people don’t like to think too strictly of God as a person. Unintelligent, simple folk may do that, or an artist, in his fertile imagination, may fancy some personal form of God. But sophisticated worshipers, priests, and theologians don’t like to take that phrase “God the father” too literally; they’d like to avoid the stigma of being considered aboriginal. There was a time in my own life also when my conceptions of God as a person proved inadequate. Back in 1966, during my sophomore year of college, I took my first philosophy course, Introduction tot Philosophy. From that point I began to reexamine all I had been taught, and my ideas of God and religion quickly began to change. I wanted like anything for God to be everywhere, in everything and every situation, because at every turn I was beset with ugly reality. Time was a relentless destroyer—seasons changed, leaves fell, a flowers faded, memory failed, dust accumulated, and true love proved false. The rust of time showed on every building, on every creature, and corroded every philosophy and art. It hung in the air and entered the blood through the lungs. Nothing endured, except . . , I endured. I had to. How could I be destroyed? I wanted to live, to exist through the fall, through the winter, and to again behold the spring, on and on eternally. The earth would die, the sun would burn out, certainly my body would disintegrate, but I would endure. I was eternal. And the spiritual essence I intuited within all transient phenomena was also eternal. And that essence was also I. The sense of “I,” however, was illusory, I concluded, a temporary phenomenon of the temporary, ever-fluctuating, rusting world around me, a world I had come to regard as illusion. From my readings and speculations I concluded that I existed, but not as a unique, individual entity. In reading Sankara’s Crest Jewel of Discrimination, I came across the Sanskrit phrase tat tvam asi: “You are that.” My reading convinced me that by meditation and study “I” was to break out of the subject-object dichotomy, out of the illusion of self-hood and ego, and merge into the all- pervading, eternal, spiritual reality that was the only true existence and the only true identity. All else was illusion. My situation wasn’t unusual—to realize that the casual understanding of God that I’d grown up with was superficial, sentimental, and philosophically weak. I was trying to increase my awareness of God. I wanted a Theology, a Metaphysics, a Weltanschauung that I could believe in, not just a religious sentiment that would crumble in the crucible of academic scrutiny. So in my own informal way I came up with a layman’s version of what the Vedic literature refers to as Brahman realization. This is the first of three classically discussed levels of God realization, each level more clear and accurate than the former. Perhaps I can best explain this with an analogy. I used to live in Los Angeles, and on a clear day, usually just after a heavy rain, I could see in the distance, just beyond the city, the San Gabriel Mountains. But usually they looked hazy and nondescript, appearing more like clouds or aberrations in the atmosphere. Then one Sunday I took my wife and three-year-old son on a picnic to Mt. Wilson. We got into the car and started driving, and soon we could see the mountains quite clearly. Within another fifteen minutes or so, we were actually driving along the Angeles Crest Highway, seeing the homes, ranches, and little crossroad villages. The San Gabriel Mountains were no longer a distant, nondescript presence on the horizon but a tangible reality, full of life and activity. People lived there and worked there. We hiked along a footpath, climbing over boulders, discovering pockets of snow, and experiencing the unusual vegetation. We even visited the Mt. Wilson Observatory. Things we had previously only been able to speculate about we were now able to see firsthand. So in this analogy, my sophomoric version of God as an all- pervasive, eternal spiritual existence is like my hazy view of the San Gabriel Mountains through twenty miles of smog. The mountains appeared as a nondescript presence on the horizon. The second level of God realization (technically known as Paramatma realization) is like a closer, clearer look at the mountains. But the final level (Bhagavan realization) is like a picnic, a hiking trip, and a tour of the Mt. Wilson Observatory all in one. I’ve already discussed the first level, now to understand the second level consider the following scenario… . High in the Himalayas a skinny, wizened yogi of indecipherable age sits cross-legged, his eyes half-closed in meditation. His diet is simple, light, and highly regulated. He has long ago given up all touch with civilization, and his mind is peaceful. No hankering to return to the comforts and sensory titillations of the city disturbs him. He is completely free from sexual interests. He has no family affection to distract him, no financial cares or responsibilities. He has no affection for the country of his birth, so he is without patriotic sentiments and obligations. He has no worldly ambition and doesn’t even care to inform others of his mastery of the yoga discipline he has been practicing for so many years. He could, of course, return to civilization and display his prowess. He could become a famous guru, exhibit his mystic powers, attract many followers, and perhaps advertise himself as an incarnation of God. But he knows that such materialistic desires are the downfall of the serious student of yoga. What’s he doing? He’s trying to go beyond the limitations of the hazy, distant, impersonal Brahman conception of the Absolute Truth. He’s been trained to meditate within. The process is extremely difficult, requiring unswerving determination, perfect health, patience, great mental power and clarity, and a long life. Now, at long last, he has detached himself from all material conditioning and awareness and, in spiritual joy, beholds within his heart the perfect form of eternity, knowledge, and bliss, the four-armed Vishnu-murti, Lord Paramatma. Our consummate yogi, absorbed in meditation on this feature of the Absolute Truth, is more advanced in his understanding than a transcendentalist fixed only in Brahman realization. Whereas all-pervasive Brahman is the bodily effulgence of the Supreme Personality of Godhead, Lord Paramatma is His personal expansion. The Supreme Person is inconceivably powerful, and He has expanded Himself in innumerable forms, each one perfect and complete. This is Paramatma, the witness, controller, and friend within the heart of every living being. In our San Gabriel Mountains analogy, our Paramatma-realized yogi is like a person who is near enough to the mountains to clearly see them, though not in detail. He has realized the Absolute Truth, but not in fullness. He has yet to realize the Supreme Personality of Godhead. This final realization is referred to in the Vedic literature as Bhagavan realization. The Supreme Personality of Godhead (Bhagavan) is Krishna, and one who understands this has surpassed the other, incomplete stages of God realization. Bhagavan realization, however, is not possible by philosophical speculation or yogic meditation. Rather, it is possible only when one receives special favor from the Supreme Personality of Godhead Himself, through His representative, the pure devotee. A pure devotee of God has already attained the stage of Bhagavan realization and has no business within the material world except for executing the mission of the Lord by disseminating the Lord’s special favor to others. The Bhagavan-realized person has entered the absolute, spiritual world, where he eternally engages in the transcendental service of the Supreme Personality of Godhead, Krishna. But he descends to this material world to give others the opportunity to come to the highest level of God realization and thus perfect their lives. 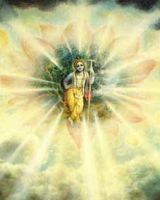 Once a transcendentalist has completed the arduous path of realizing the Absolute Truth as impersonal, all-pervasive Brahman (step one) and as Lord Paramatma in the heart (step two), then he must surrender to a pure devotee of the Supreme Personality of Godhead, to one who has already fully realized Bhagavan and who is at one with the Absolute Truth, being engaged in His absolute devotional service. Thus, by taking guidance from such a Bhagavan-realized person, a transcendentalist can complete his course and come to the third and final level of God realization. But what if one is not already advanced in philosophical speculation and yogic meditation? Is he at a disadvantage for realizing the highest truth? No. The favor of the pure devotee is so powerful that anyone who receives it can enter the spiritual reality of serving the Supreme Personality of Godhead. The Bhagavan- realized pure devotee of God serves as a spiritual master, guiding the aspiring transcendentalist toward perfection. He instructs him in the science of the Absolute Truth and acquaints him fully with the transcendental forms, qualities, activities, and names of the Supreme Personality of Godhead, although these are beyond the material world and beyond the purview of the material mind and senses. This is the special power and authority of the pure devotee of the Supreme Person: being of the transcendental world, he can introduce that eternal reality to any sincere, submissive servant, especially by training him in the chanting of the Supreme Lord’s transcendental names: Hare Krishna, Hare Krishna, Krishna Krishna, Hare Hare/ Hare Rama, Hare Rama, Rama Rama, Hare Hare. Because the Bhagavan-realized spiritual master perfectly understands his eternal position as the servant of God, he can perfectly impart this understanding to his student, elevating him to the position of transcendental, loving service. Thus the student learns that although he is one with God, that oneness is in quality, not in quantity. The Lord is great, but he is small. The Lord is master, but he is servant. Now the whole picture of the Absolute Truth comes into focus, and the lower stages of God realization are seen in their proper perspective—in relation to the Supreme Personality of Godhead. Take, for example, those impersonalistic views I formulated back in college. I had a conception of God as all-pervasive spiritual reality, and I asserted that I was spiritual and eternal, persisting through all the changes of this material world. This much was right. But on certain key points I was wrong. And where I was wrong, boy was I wrong! In my eagerness to go beyond the ephemeral, I had rejected not only the false ego that I was this material body—born in south Mississippi, son of Mr. and Mrs. George C. Bosworth—but I had also rejected the prospect of real ego. I see now that the little spiritual learning I had then was a dangerous thing. Although to deny my material identity was good, to disregard the possibility of spiritual identity was like throwing out the baby with the bath water. In seeking an egoless state, I was courting spiritual suicide. I was denying that I had any individual spiritual identity and denying that God could be an individual. Thus, in an attempt to make God unlimited, I had restricted Him: “God can’t have a personality, a form, desires.” And not only was I restricting God, but I was trying to usurp His position. And as for worship, that was all right, but on a higher level it made no sense. After all, the idea that I was a separate identity from God was supposed to be illusory, so why all the hullabaloo over worship? Worship was for the less intelligent, the anthropomorphists, the aborigines. Of course, worship could be helpful—as long as you kept your wits about you and didn’t fall back into the subject-object dichotomy. Thus my new-found sophistry gradually twisted all my praise of God into the devotionless, even disrespectful utterances of a sycophant. Tat tvam asi: “You are that.” Yes, I was it. I was really it. You might well wonder why the scriptures bother to describe the impersonal feature at all. Why not skip on over to the highest realization, the Supreme Personality of Godhead? Well, there’s a reason. The first lesson in spiritual life is to understand that God and spiritual reality are the exact opposite of material reality. If God is presented to our grossly materialistic mentalities as a person, we’ll think that He’s an ordinary person (anthropomorphism). So the scriptures describe God as being without form and qualities, because He is without material form and qualities. But the natural tendency of the neophyte is to do as I did, and throw the baby out with the bath water. From Vedic literatures, like Bhagavad-gita, and from the teachings of my spiritual master, His Divine Grace A.C. Bhaktivedanta Swami Prabhupada, I now understand what true spiritual oneness is. You don’t have to subscribe to the philosophy of anthropomorphism to hold a personal conception of God. Anthropomorphism refers to human beings’ theoretically ascribing personal characteristics to the Supreme. This is only speculative imagination, however, and cannot help one realize the Supreme Personality of Godhead. When one attains the highest stage of God realization, Lord Krishna reveals Himself as a person; it is not a question of imagining God as having personal attributes, as in the painting by Michelangelo. God creates man in His own image, not vice versa. God’s image is fully spiritual, transcendental, eternal;man’s image is material and temporary. And you don’t have to succumb to the vain self-flattery and covered blasphemy of impersonalistic philosophy to achieve liberation from illusion and to affirm that God is unlimited and that there is spiritual oneness. As one in the highest stage of God realization understands. God is a unique, individual person, and at the same time He is everything. Consider the analogy of fire. Although it’s in one spot, say your fireplace, it permeates and pervades the entire room by its energies: heat and light. Heat and light are simultaneously fire and not fire. Similarly, the Supreme Personality of Godhead, although an individual person in His spiritual abode far beyond the material creation, is present everywhere by His energies: matter and spirit. His energies are simultaneously one with Him and different from Him. There is no meaning to the Supreme without His energies and no meaning to His energies without Him. In fact, nothing exists but the Supreme Personality of Godhead and His energies. A person in the highest stage of God realization, therefore, sees simultaneous spiritual oneness and spiritual diversity. So, getting back to my original questions, if you said God was everything, you were right—partly. And if you said God was an individual person, you were also partly right. But just how God reconciles these apparent contradictions and manifests Himself everywhere without losing His individual personality is a transcendental mystery that can be understood only by one engaged in the Supreme Lord’s loving service under the guidance of a Bhagavan-realized spiritual master. Now, if you said that God is living within everyone’s heart, again you were partly right. Lord Krishna expands Himself not only by His energies but by His personal transcendental form of Paramatma as well. Lord Paramatma, in the heart of every living being, is Krishna Himself, the Supreme Personality of Godhead, but the Paramatma-realized yogi doesn’t fully realize this. Because he doesn’t have the benefit of devotional service, he may consider himself one with Paramatma, much as the Brahman-realized person considers himself one with Brahman. Only by the grace of a pure devotee of the Supreme Personality of Godhead can the Paramatma-realized yogi (or anyone else) enter into the Lord’s transcendental service and understand Him in full. The Paramatma, however, is eager to fully reveal Himself—His transcendental names, activities, and forms—to the sincere transcendentalist. Vedic literature, therefore, describes an external manifestation of the Lord in the Heart, and this is the Bhagavan-realized spiritual master. By submissively hearing and serving the spiritual master, one contacts the Paramatma and becomes qualified to receive His directions and enlightenment from within the heart. Thus one engaged in devotional service under the guidance of a bona fide spiritual master has already achieved Paramatma realization. But without taking guidance from God’s representative from without, one should not expect to receive direct revelation of God from within. So if you’re serious about God realization, the key is to seek the shelter of a Bhagavan-realized spiritual master. As Krishna says in the Bhagavad-gita (4.34), “Just try to learn the truth by approaching a spiritual master. Inquire submissively and render service unto him. The God-realized souls, having seen the Truth, can impart knowledge unto you.” So don’t expect to understand the Supreme Personality of Godhead without the guidance of the spiritual master. Even if you study the scriptures very carefully, you won’t be able to avoid the pitfalls of impersonalism. And don’t take that just as my advice, thinking that what happened to me years ago can’t happen to you. Take it as the conclusion of the revealed scriptures: Lord Krishna states in the Bhagavad-gita that only by devotional service, under the guidance of the spiritual master, can one understand the Supreme Personality of Godhead. Under the spell of material illusion we have forgotten our eternal relationship with Lord Krishna as His servants. Thus we are suffering birth and death repeatedly, life after life, in the material world. Sometimes we try to find happiness in gross sensual activities, as an animal or animalistic human being; sometimes we tire of this futile attempt at imitating God and take to philosophical speculation, culminating in declaring ourselves to be God; and sometimes we seek happiness through yogic asceticism and meditation. But only when we take up the devotional service of the Supreme Personality of Godhead are we able to end our material illusion and suffering for good and achieve the full, intimate understanding of the Supreme Personality of Godhead, Lord Krishna.